With just enough detail — and color-coded links that send students to more detail if they need it — this is the rhetoric that tells students what they need to know and resists the temptation to tell them everything there is to know. Designed for easy reference — with menus, directories, and a combined glossary/index. 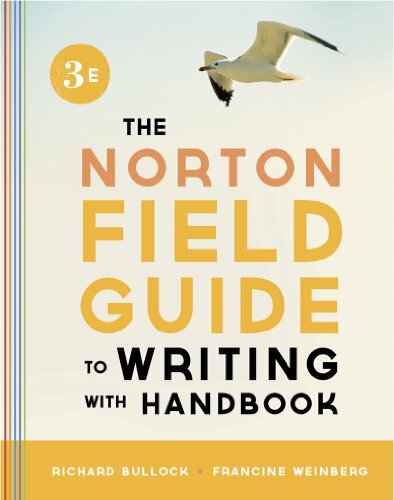 The Third Edition has new chapters on academic writing, choosing genres, writing online, and choosing media, as well as new attention to multimodal writing.The Norton Field Guide to Writing is available with a handbook, an anthology, or both — and all versions are now available as low-cost ebooks. Norton Field Guide to Writing, and his scholarship and teaching focus on the teaching of writing. Francine Weinberg (M.Ed, Teachers College, Columbia University) is an author and editor who has worked for more than 30 years on college and high school English textbooks. She's the author of the handbook in The Norton Field Guide to Writing.